My work cafeteria serves the best muffins. I’m really picky. I’ve worked at enough places that serve pre-made muffins or use those giant, plastic squeezy pouches of muffin batter, boasting they’re “freshly baked.” This might be true, but the muffins are certainly not homemade. The cafeteria at work bakes muffins in wide, shallow tins. The big tops are golden brown and crisp while the insides are fluffy and moist. On any given day you can find five to six flavors, all saved warm if you go first thing in the morning. This fall I’ve been adjusting to a more traditional work schedule at a corporate headquarters in downtown Minneapolis. I’m really excited about getting the job experience I was hoping to find and pursuing a career. Now that we know we won’t be moving every couple of years, it seems like a good time to do this. Many days after work, I just don’t want to cook. Jake gets home even later than I do so I like to get dinner started. 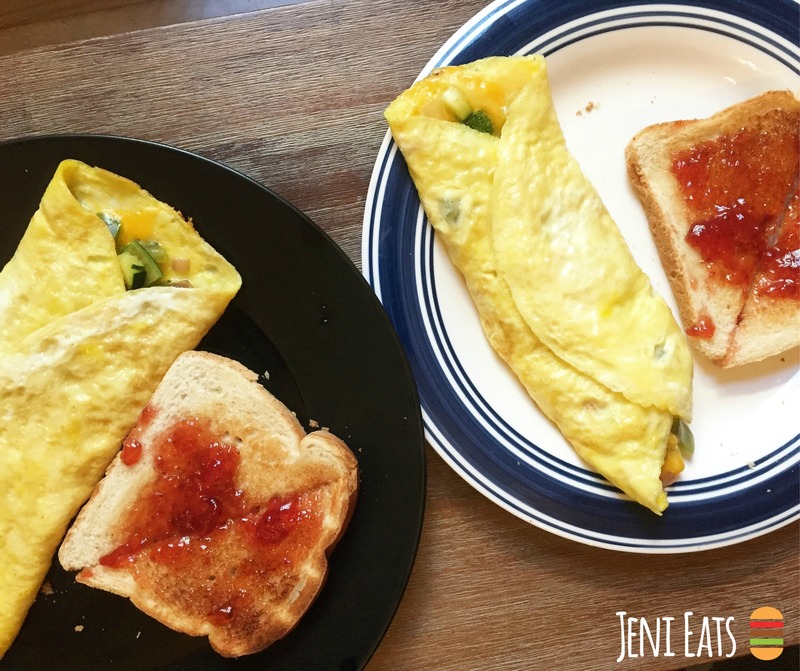 My motto is “There’s always eggs.” Fried, scrambled, hard-boiled, served in a toast hole, or formed into an omelet, they always make the perfect humble feast. I still order groceries from Coborn’s from time to time. Now that the farmers markets are in full swing, I’ve been making my rounds. I’m old and I can’t sleep in anymore so I head to the farmers market early Saturday mornings. When you’re first to the market, nothing runs you, crowds are minimal and parking is plentiful. I enjoyed the best eggplant and paneer curry at an Indian food vendor at the Midtown Farmers Market in Minneapolis. The owner invited me to try her specials and I loved this curry. I can’t her website, but the sign above the stand said Krishna. This weekend the downtown St. Paul farmers market was full of asparagus, pea greens, radishes, sweet peas, and beets. I stocked up on produce and plenty of radishes to make my favorite breakfast: Bread (or crackers) spread with butter and topped with sliced radishes and salt. Kombucha-making probably warrants its own post. But long story short; my cousin is an experienced kombucha-maker who sent us some scobies. Scobies look like freaky alien blobs. They reproduce by growing baby scobies on top of themselves and also grow yeast “beards.” We named ours Sue. These bacteria-yeast colonies are necessary to ferment sweet tea into kombucha. You know, those super expensive bottles that you see in the store? You can make it at home with just black tea, sugar, water and juice (or fruit). Making kombucha isn’t hard, but it takes time. You need time to acquire and clean your bottles and jars, time to make and cool the tea, time to ferment, time to strain and bottle. The process is easy and cheap, but it takes time and there’s just no rushing it. 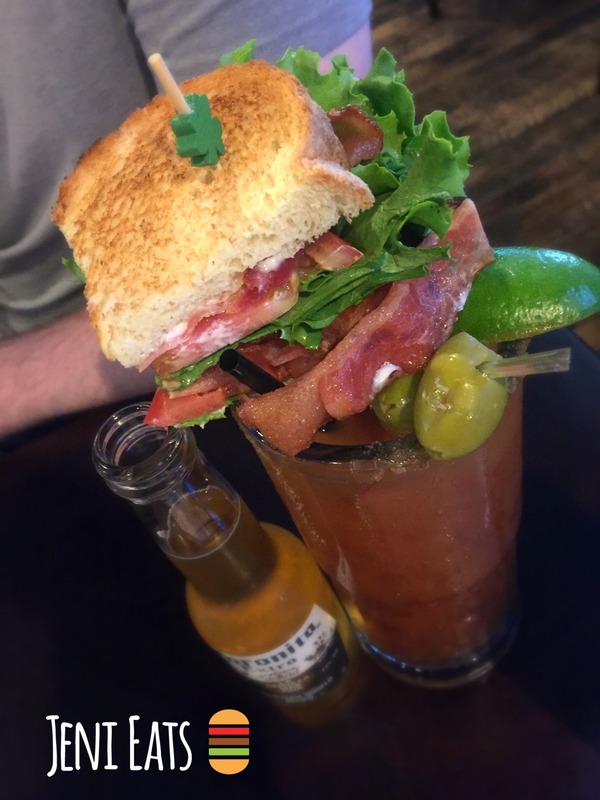 What the heck is a BLT Bloody Mary? We met friends for brunch at Lucky’s 13 Pub. We have been infrequent brunchers, especially with my job working at a bakery in St. Louis on weekends. Now that we’re on the same schedule, we brunch sometimes. Lucky’s promotes a signature BLT Bloody Mary and I thought it was the oddest thing to integrate lettuce into the drink. When it arrived, I understood. A few years ago I posted a photo of our first charcoal grilling attempt and everyone made fun of me because clearly we didn’t know how to grill. We bought a chimney (just as you all recommended) which makes charcoal grilling easy. I like making my own version of Northwest Steakhouse’s Greek-style steak and marinating everything else in gochujang. There’s some very satisfying about grilling your own steak so rare it’s almost socially unacceptable after a long day at work. This weekend it was Jake’s turn to pick the restaurant/cuisine. He wanted some really good, fancy-ish pizza. The hard part was choosing a restaurant. We have a lot of really good pizza places in the Twin Cities (however, you will absolutely not find a single place that serves Provel). We hadn’t visited Chef Ann Kim’s first restaurant Pizzeria Lola. We knew it would be good because everyone we know says so and we liked Young Joni. I love that Chef Kim serves wood-fired pizza infused with Korean flavors. Go with a friend and order a classic Italian pizza topped with the type of pepperoni slices the curl into delightful cups and a Korean pizza topped with kimchi or bulgogi. Then, share. It’s the best kind of fusion. I loved this post and am happy to have met Sue. ? I had no idea the process for making kombucha and I doubt I have the patience for it. I am going to do that rhubarb syrup one of these days. I’d love to hear more about your kombucha process. I’m equally grossed out & enthralled. The grossness makes it so enthralling;) Will share more soon.